Three problems often hinder people from sharing their faith. 1) They don’t know how to get the conversation started. 2) They are afraid that someone will ask a tough question for which they don’t have an answer. And 3) They don’t feel like they know how to end the conversation with an action step. We have a solution that addresses all three of those challenges. We’ve designed a business card that gives information about Calvary Chapel Living Hope. You can start any conversation by pulling out the card and saying, “I’d like to invite you to come to my church.” Or, “I think you might like our church. Here’s a card.” That gets the conversation started in a spiritual direction. On the back of the card there is a link to video answers to tough questions people are asking today. We’ve partnered with TrueLIfe.org to use their website solutions. It’s a beautifully designed website prepared to provide compassionate answers to the questions people are asking now. You may have an opportunity to share Jesus with someone on the spot, but more likely, you’ll invite them to come to church. A caring and welcoming attitude often touches people in a special way. 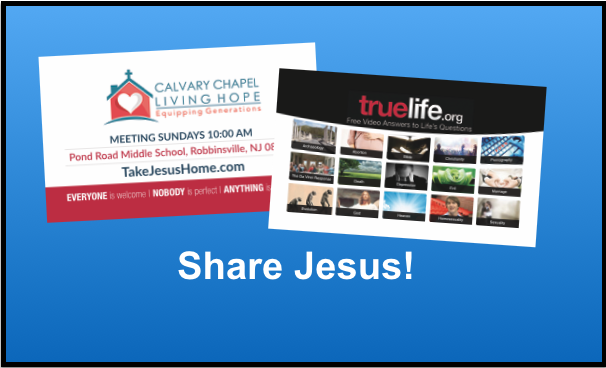 As you share these business cards with people, you are offering them a path to find Jesus Christ as their Lord and Savior. Please pick up some cards at the Information Table on Sunday. Carry them with you because you never know when you’ll have an opportunity to share with someone.